We are a boutique resort hosting a seven-day, six-night luxury culinary and cultural vacation program at a private villa. 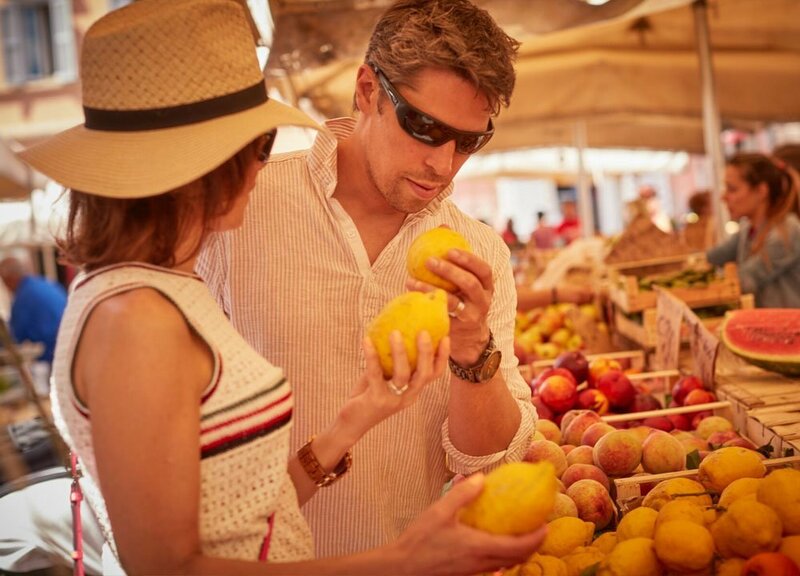 We combine food, culture, exclusive excursions and fun into an experience of a lifetime! The best of the countryside is combined with our proximity to Rome providing tours into Umbria, family-owned wineries, Rome, Tivoli, Orvieto and castles in Sabina. Enjoy access to places and people you would not find on your own. This creates a unique and AUTHENTIC experience that is unforgettable. When our guests depart after a week of our hospitality, they feel they got to know the “real Italy” with its people and culture. Arrival after an airport, hotel or train station pickup. Enjoy a light welcome lunch or brunch followed by relaxation around the villa, gardens, pool, etc. An evening welcome dinner is provided so that guests may get acquainted and learn about the exciting week ahead. Begin each morning with a relaxed buffet breakfast under one of the covered verandas or outdoor terraces overlooking the olive trees and countryside or in our dining room. The first cooking lesson begins mid-morning with our professional chef. You will learn how to prepare some of the best regional and seasonal dishes. (Lessons are for all levels of foodies and designed to be hands-on and fun). After lunch, just relax or enjoy an optional massage by a professional Masseur. 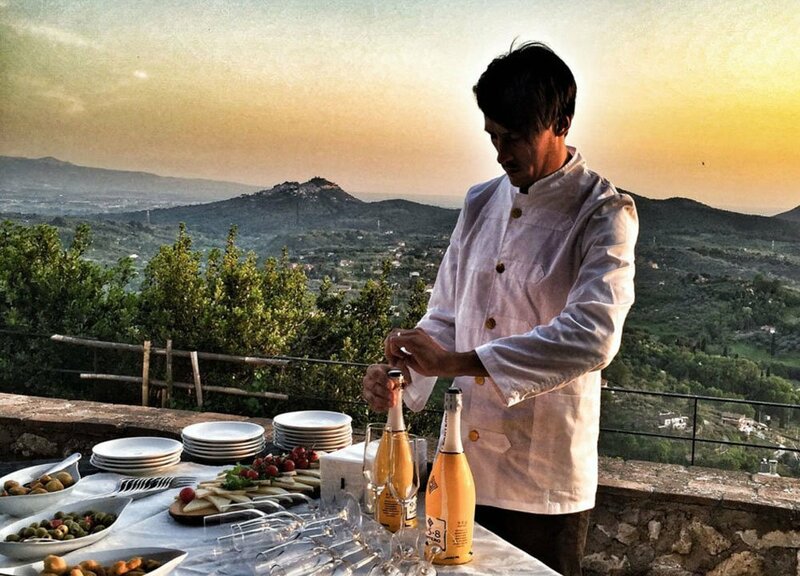 Late afternoon, you will head to a local medieval castle in Sabina for a private tour and sunset prosecco reception. This is a rare opportunity to tour the castle and absorb the rich history and stunning views. We will enjoy a private dinner prepared exclusively for us set among the Renaissance paintings and frescos. After breakfast, we visit the ancient hilltop town of Tivoli for a guided tour of the beautiful gardens of Villa d’Este, where you will be amazed at the ancient villa, renaissance gardens and fountains. Along the way, we will visit the morning farmers market as the locals do. 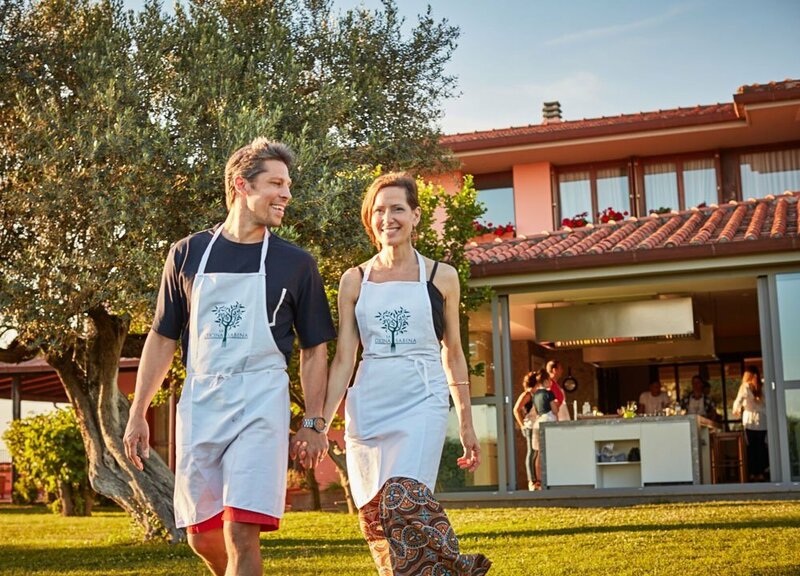 After lunch at renowned local restaurant in Tivoli that overlooks ancient Roman Temples, we return to La Cucina Sabina for your afternoon lesson followed by dinner on the sunset terrace overlooking the olive groves and Monte Serrate (weather permitting). Late morning depart for “Discover The Secrets of Ancient Rome” tour. In a special, guided tour of the city, we visit places not normally seen by tourists, making your visit very special and unique. Both lunch and dinner will be enjoyed in Rome. The afternoon also offers optional independent shopping or leisure time. 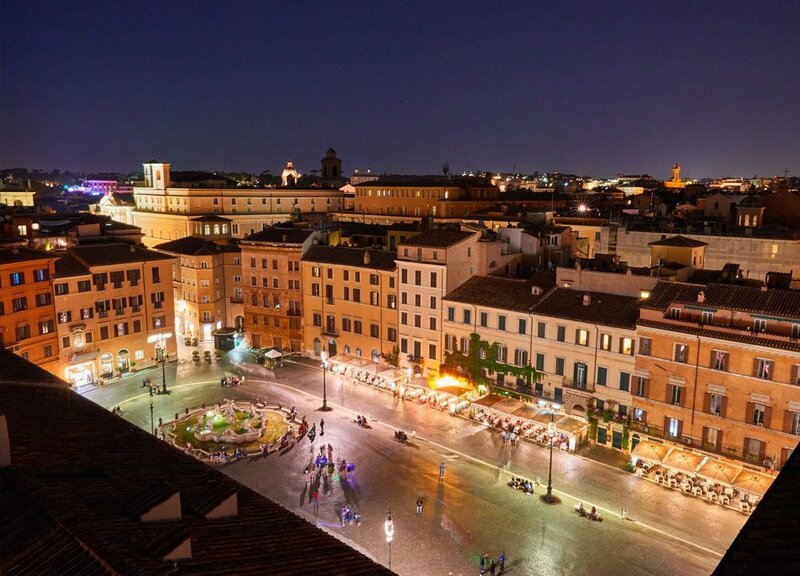 Dinner is at a trendy rooftop bistro/restaurant in the historic center of Rome and offers an unsurpassed 360 degree panoramic view of the ancient skyline and magical sunset. After breakfast, enjoy a scenic drive through the foothills of northern Lazio toward Umbria on your way to the family-owned Mazziotti winery overlooking Lake Bolsena. You’ll taste their wines and eat lunch with the winery owners in their private tasting room. 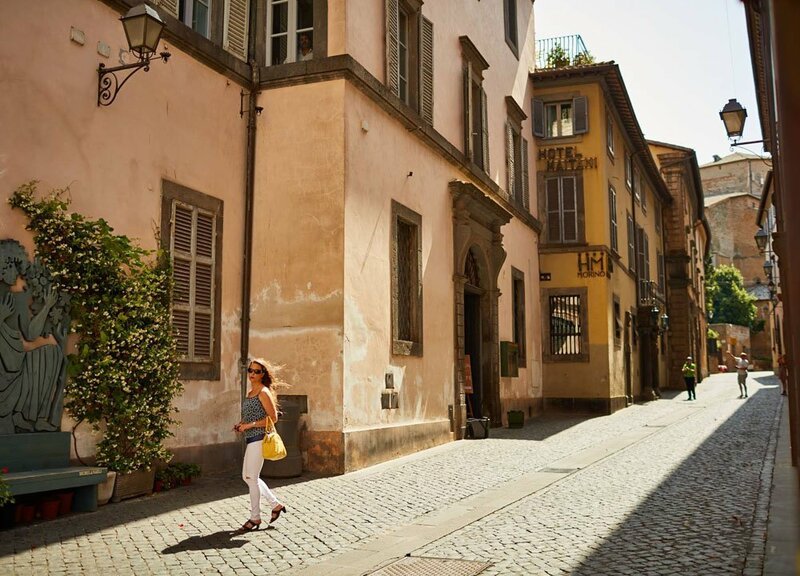 After the winery, stroll through the wonderful hilltop Umbrian town of Orvieto, with its dramatic vistas, medieval walls, Etruscan ruins, shops, and cathedral. This town dates back to ancient Etruscan times. In the evening, you will learn how to make pizza using our authentic outdoor wood burning oven. 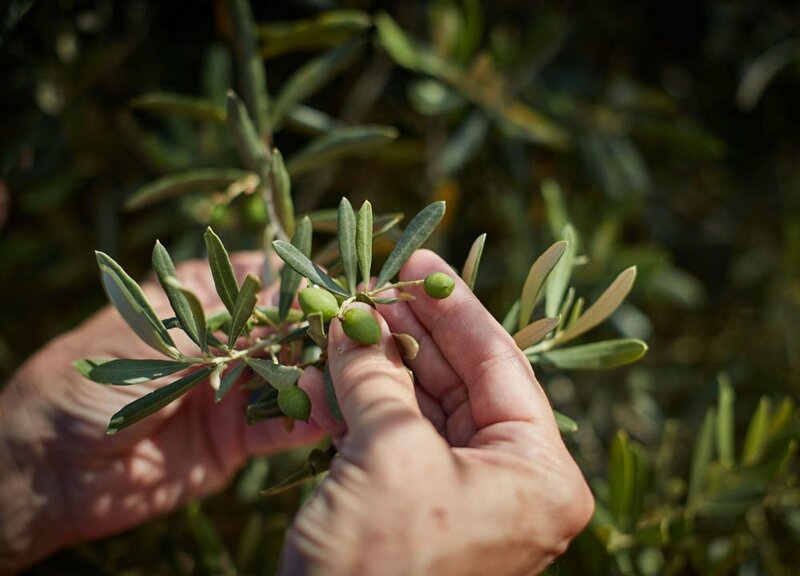 We begin our olive oil tour and lesson right at our villa touring the olive grove and learning the care and nurturing that goes into growing some of the best olives in the world. Learn what the Romans knew about growing olives 2000 years ago. We also tour our local “frantoio”or olive mill, to see how the cold processing of extra virgin olive oil is done. Back at the villa, you will taste olive oils and come to understand what makes an olive oil great. After some leisure time or massage, you will have your fourth lesson with our chef. Using all your new skills, you will cook everything from antipasto to dolce! After a light breakfast and goodbyes, transfers are provided to Rome’s airports or train stations for return trips or extended travel in Italy. Download a sample itinerary HERE. We provide a full schedule but also include time to relax and enjoy the grounds and each other’s company. You may add optional massages or opt out of any activity if you prefer a swim in the Olympic sized pool or simply to relax. We provide a small group vacation and so try to be flexible to accommodate your needs as best as possible.